UMP | University of Minnesota Press Blog: Laurie Hertzel series, Part 3: When I Was ... starting out as a reporter. 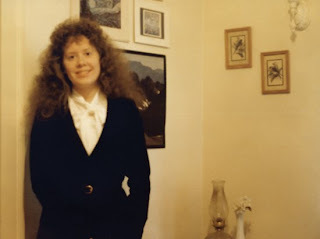 Laurie Hertzel series, Part 3: When I Was ... starting out as a reporter. Laurie Hertzel bought this silky blouse and suit when she first became a reporter. After about a week on the job, she learned that it wasn't exactly practical for all breaking-news assignments. In those early years, when I was first a reporter, the newsroom was a vibrant and busy place. The old guard was retiring, and most of the new reporters were fresh out of college and eager to make their mark. There were way more reporters than editors, and so we had a lot of freedom. Editors would assign a story in rather vague terms (“I hear there’s a guy up the Shore who wants a traditional Viking funeral. Go talk to him.”) and we’d grab a set of car keys from the little wooden box that hung on the wall by the police scanner, and off we’d go, up the highway, out of town, into the great vast piney Northland. Oh, it was fun. In my memories of those years, it is always summer, and I am tooling up to the Range or over to Northwestern Wisconsin, maybe with photographer Joey McLeister or John Rott or Steve Stearns, and we are gabbing the whole time, telling secrets, laughing, talking nonstop. Joey and I went to Grand Marais one year, to write about a Maxwell House coffee commercial that was being filmed up the Gunflint Trail. We stayed in the old East Bay Hotel, with its crooked floors and bathroom down the hall and tiny black-and-white TV that seemed to play nothing but reruns of “The Man from U.N.C.L.E.” Our room looked right out on the rocky shore of Lake Superior, and at breakfast we ate their famous raisin-rye bread and watched an osprey walk up and down the beach. I don’t remember much about the commercial itself, now, except for the theatrical producer who strode around in the great north woods trying to build drama out of a steaming cup of coffee. She and I also drove over to Iron River, Wisconsin, one year to write a story about a fish hatchery. We talked to the hatchery guy for what felt like hours, in a small, closed room that was very warm and smelled of fish. He droned on and on about hatchlings and water temperature and fish production. Did I fall asleep? Not quite. Did Joey? I’ll never tell. Rott and I went to Two Harbors once to cover a story about a civic celebration. We were separated in the crowd, but on the way back to Duluth found out that his lead photo matched the planned lead of my story perfectly. Now that’s a good working relationship. And then up pulled a TV truck, and out popped a glamorous blonde news anchor, who approached the chief and refused to take no for an answer. “This will just take a minute,” she said, lights and video trained on the poor guy, and he continued to fight the fire, but he also gave her information, and I thought, “Ah, this is how it’s done.” And when she finished I barreled my way in behind her, and got what I needed. I just love these, Laurie. thanks, Kim. they are quite fun to write.